Natural disasters could have a huge impact on the medieval world – they could ruin cities or regions, and leave tens of thousand dead or homeless. These disasters – earthquakes, floods, volcanic eruptions – were written about by chroniclers of the time, who left vivid accounts of the destruction they caused. 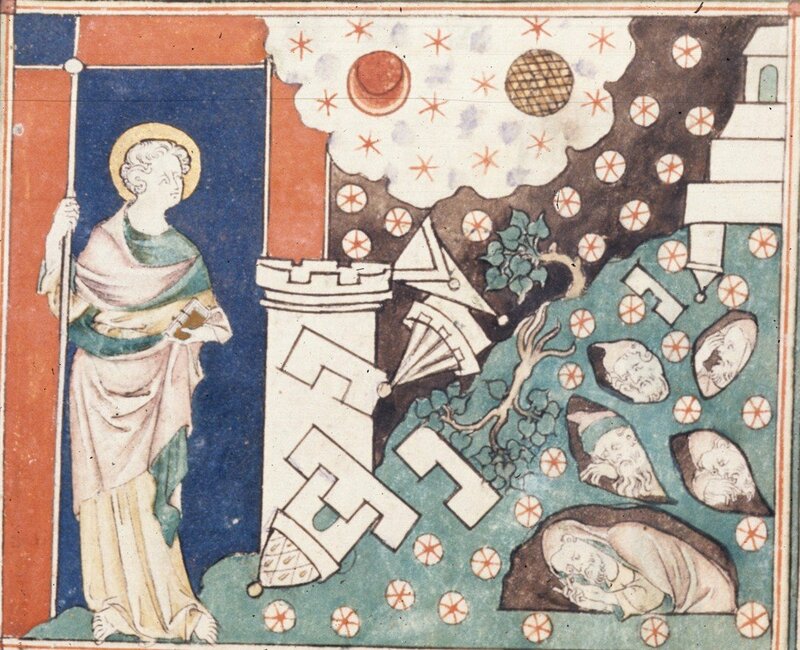 Here are ten of the most important natural disasters that took place in the Middle Ages. It was a terrible and distressing collapse, impossible for anyone to recount. Such was the violent and harsh disaster, which was sent from heaven, that fire alight and consumed those who had escaped from the terrible vehemence of the cataclysm of the earthquake and the collapse: the sparks flew and set fire to everything on which they settled. The earth itself from below, from within the soil, surged, seethed and burned everything which was there. Thus the foundations as well, together with all the storeys above them, were lifted up, heaved up and down and burst apart, collapsed, fell and burned with fire… In the end no house or church or building of any kind remained, not even the garden fences, which had not been torn asunder or damaged, or had not disintegrated and fallen. The rest burned, crumbled away and became like an extended putrefaction. When the residence collapsed and fell, he happened to fall into the cauldron. The whole of his body sank down in it, and he was cooked in the pitch. His head was found (hanging, as if he had) fainted, outside the rim of the cauldron. Thus he was recognized from his face, while his bones were found stripped of the flesh in the pitch…And fear and trembling seized all who saw it. Between 250,000 and 300,000 people died in the earthquake. The Byzantine Emperor sent 500 pounds of gold so that the city could be rebuilt, but Antioch never recovered and throughout the Middle Ages it continued its decline until by the 15th century when it had only a few hundred people remaining. In 2013 scientists announced that they had discovered that a volcano located on Lombok Island in Indonesia exploded sometime between May and October 1257, in it was the largest blast the Earth had seen in 7000 years. The discovery has helped historians to understand the events of 1258, where cold temperatures ruined crops and brought famine to much of Europe. The English chronicler Matthew Paris wrote that during this year “the north wind blew without intermission, a continued frost prevailed, accompanied by snow and such unendurable cold, that it bound up the face of the earth, sorely afflicted the poor, suspended all cultivation, and killed the young of the cattle to such an extent that it seemed as if a general plague was raging amongst the sheep and lambs.” It is believed that London saw as many as 15,000 deaths that year, and some scientists speculate the volcanic explosion was one of the factors in the Little Ice Age that affected global temperatures from the 14th to 19th centuries. The Mongols under Kublai Khan tried to invade Japan twice in the 13th century – the first time in 1274 and the second in 1281. On both occasions the fleets were destroyed by typhoons, which the Japanese believed was heavenly assistance. They called these storms Kamikaze, meaning ‘divine wind’. The massive fleets under the Mongol command – the second was reportedly four thousand ships carrying 140,000 men – were destroyed by the typhoons, leaving the invaders either drowned or captured. a terrible earthquake shook Sicily with such force that it was een felt in Calabria, around Reggio and nearby cities. The extremely wealthy city of Catania suffered such destruction that not a single house survived within the city. About 15,000 men and women together with the bishop of that city and most of the minks were crushed under collapsing buildings. At Lentini a fine town belonging to the Syrcausans, the weight of collapsing buildings shaken by the same earthquake killed most of the townspeople. Many fortresses were also destroyed in the territory of the Catanians and Syracusans. In a number of places the earth gaped open and produced new watercourses while closing up some old ones, and that part of the summit of Etna which faces Taormina seemed to sink down a little. At Syracuse the very famous spring called Arethusa, which according to legend brings water to Sicily by secret channels from the city of Elis in Greece, changed from a trickle to a great flow, and it water turned salty because of the amount of sea water mixed up in it. A great prodigy appeared in Gaul at the fortress of Tauredunum, which was situated on high ground above the River Rhône. Here a curious bellowing sound was heard for more than sixty days: then the whole hillside was split open and separated from the mountain nearest to it, and it fell into the river, carrying with it men, churches, property and houses. The banks of the river were blocked and the water flowed backwards. This place was shut in by mountains on both sides, for the stream flows there through narrow defiles. The water then flooded the higher reaches and submerged and carried everything which was on its banks. A second time the inhabitants were taken unawares, and as the accumulated water forced its way through again it drowned those who lived there, just as it had done higher up, destroying their houses, killing their cattle, and carrying away and overwhelming with its violent and unexpected inundation everything which stood on its banks as far as the city of Geneva. It is told by many that the mass of water was so great that it went over the walls into the city mentioned. And there is no doubt of this tale because as we have said the Rhone flows in that region between mountains that hem it in closely, and being so closely shut in, it has no place to turn aside. It carried away the fragments of the mountain that had fallen and thus caused it to disappear wholly. In 2012 researchers at the University of Geneva examined what had happened in the Tauredunum event, and concluded that a similar landslide could cause another tsunami on the lake. On December 14, 1287, a massive storm tide swept into the Netherlands and Northern Germany, breaking dikes and leaving between 50,000 to 80,000 people dead. It is considered the sixth worst flooding incident in recorded history, and left permanent changes to the landscape of the Netherlands – for example, the Zuiderzee was partially created by the storm, making it an inland sea. The same storm also killed hundreds of people in southern England. a large earthquake occurred in Mutsu province with some strange light in the sky. People shouted and cried, lay down and could not stand up. Some were killed by the collapsed houses, others by the landslides. Horses and cattle got surprised, madly rushed around and injured the others. Enormous buildings, warehouses, gates and walls were destroyed. Then the sea began roaring like a big thunderstorm. The sea surface suddenly rose up and the huge waves attacked the land. They raged like nightmares, and immediately reached the city center. The waves spread thousands of yards from the beach, and we could not see how large the devastated area was. The fields and roads completely sank into the sea. About one thousand people drowned in the waves, because they failed to escape either offshore or uphill from the waves. The properties and crop seedlings were almost completely washed away. While rare, tornadoes have been recorded in many medieval sources. One scholar has found at least 21 instances where a tornado was seen in Britain during the Middle Ages.